You are here: Home / Featured / Uncanny X-Men 3D #1 Review! 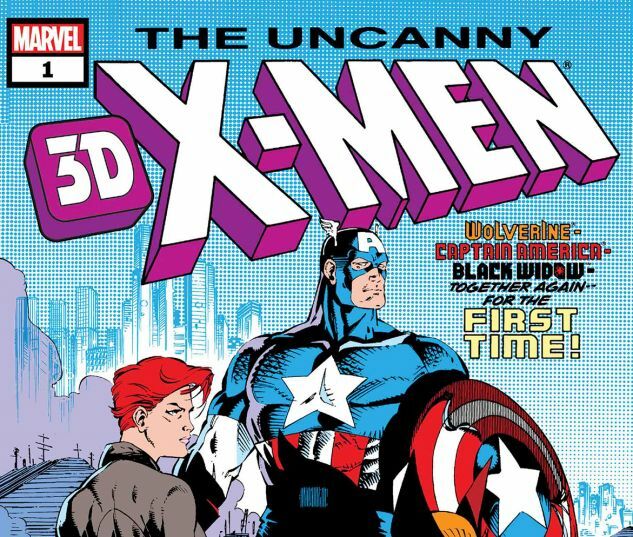 Uncanny X-Men 3D #1 Review! They say you get what you pay for. Sometimes you get a little bit more for your investment; other times, perhaps not so much. That said, this week sees the release of a Marvel yesteryear classic all done up with an attention-grabbing new visual treatment designed to make everyone “ooo”, “ahh” and say: “Hey, look at that!”. But where exactly does this interpretation of Uncanny X-Men #268 land on the “value” scale? First off, a brief history lesson: 3-D comics in and of themselves aren’t that new- literally a toe-in-the-water experimental gimmick for almost as long as comic books themselves have been around. Periodically there are popularity spikes, the most iconically obvious being the 1990s. The artform also saw something of a mini comeback renaissance in the aughts, however, it’s never really been a venture Marvel’s been known to intensely champion, per se. Marvel has been hitting the single-issue reprint market pretty hard lately, though. Their recent initiatives such as the dollar “True Believers” line and the more upscale “Facsimile Editions” featuring all the original content plus retro ads are seemingly not without their shelf traction. But, kid gloves off here now- as this 3-D re-issue ups the ante, it also overextends as a bit of a transparent cash-grab driven tremendously by nostalgia and the underpinnings of corporate synergy. It’s still an enjoyable experience but let’s face it- at an eight-dollar price tag you are essentially buying a movie ticket. It’s certainly analogous in that this comic does indeed come with a bit of “presentation experience,” much like going to the movies. As it arrives in a see-through poly-bag, there’s no way it can’t trigger certain, perhaps cringeworthy, flashbacks to the boom and bust 1990s (Sub-trigger: do you now want two copies??). There’s also the obligatory one-size-(hopefully)-fits-all fold-out cardboard glasses, with the traditional one red lense and one blue. In keeping with the theme of the “x-perience” (pun intended, groan at leisure), the eyewear’s done as a pseudo-Cyclops eyebeam visor, complete with “X” logos on the arms. So, coolness points there. While the paper stock in use is certainly an upgrade from the more rough-hewn newsprint style of the circa 1990 original, it’s also worth noting that it’s tactility different from Marvel’s other books. It’s just as glossy as any other current floppy but perhaps not as slick. There’s also a certain “sturdiness” to these pages that the others don’t have but perhaps that’s a factor indicative of the whole 3-D process. Perhaps it’s just the kinda quality your eight bucks buys you. In order to achieve the actual “off-the-page optics”, Marvel has enlisted an outside media company, Anomaly Productions and to them alone really goes any sort of all-new, all-different credit (outside of Marvel editorial, that is). Anomaly’s efforts to project a genuine “3-D effect” onto the static comic page is indeed truly more hit than miss but that’s not to say that you really still have to line it up just right at times. Occasionally, some panels come off a little wonky from the effect, but it seems chalked up more to cartoonish elements of the original work perhaps not wearing as well as they once did. Indeed it’s that very “nuff said”-ness that made Uncanny X-Men such a needle-moving phenomenon back in the day (arguably, it was the needle, for a while anyway) and in that spirit it is apparent why a representative of its catalog would be chosen for what seems to be more or less a “novelty”-type venture, albeit of high quality. Tapping into the zeitgeist of the modern MCU probably doesn’t hurt either and may also hope to snag a new reader or two who isn’t familiar with the story’s historical placement and just gets drawn in from A-list star cross-pollination. As much as this story is indeed regarded as a time-honored fan fave, it does raise an eyebrow as to a script by Chris Claremont, a writer highly renowned for the purplest of prose, being the go-to choice for a decidedly visually-intensive treatment. In this, the severe onslaught of words at times distracts the eye from what should be the main focus: the bold “coming-at-ya”-ness of Jim Lee and Scott Williams’ art. Countering this in the best way possible, though, is lettering legend Tom Orzechowski. In many respects, “Orz” is/was to the X-phenom of its heyday what film sound designer Ben Burtt is to the Star Wars franchise and in this new edition, his famously hyper-expressive word balloons and onomatopoeia get an extra helping of in your face punch-up! In terms of colorist Glynis Oliver’s original palette, which is usually known for an assortment of recognizably vibrant hues, in the new mix all the art has a much darker tone. This may in part be due to the 3-D process as even contrasting the new pages against the digital version on Marvel Unlimited, there is a noted difference. So, bottom line? Yay or nay? It’s actually kinda rides the line. Mileage will certainly vary here- especially on anyone’s given tolerance for wearing tiny cardboard glasses and staring at optically enhanced pictures. 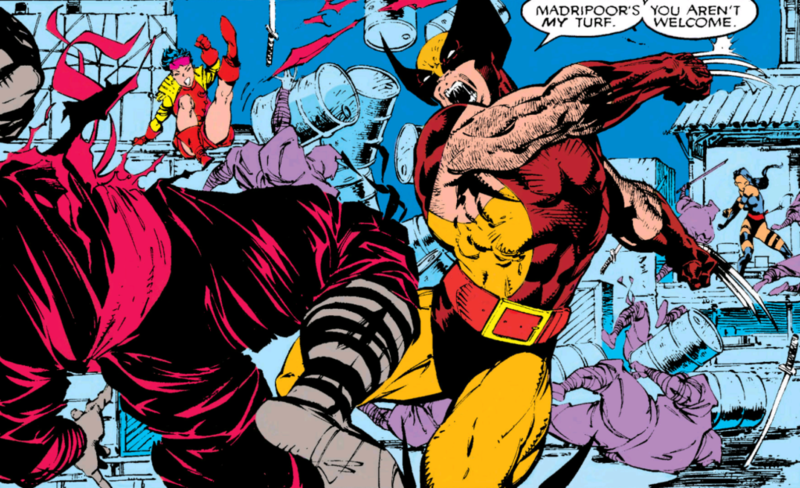 Also, full disclosure: anyone seeing the “#1” on the cover and thinking they are getting in on the ground floor of something is going to be in for quite the surprise as “Madripoor Knights” (originally appearing as Uncanny X-Men #268) is, despite its flashback-heavy accentuations, very much a middle chapter. Perhaps the approach is once more like the original Star Wars. Perhaps Marvel will make another one of these again some day as well. Iron out a few hiccups and maybe throw in a bit of behind-the-scenes to offset that price point a bit, and then we’ll really be talking something special. While I can understand the commercial wisdom of choosing an old comic starring three MCU icons, I can think of a truckload of single issues which would’ve popped better and brighter. If we’re talking Jim Lee UXM, then 275 — in-your-face eye candy by the score, both of the space opera and jungle utopia variety, plus a significant turning point for Magneto — would make a lot more sense to me. And while 275 doesn’t really stand as a self-contained story, neither — as Matt has already noted — does 268. Missed opportunity. I would agree this is an odd choice, for an odd release. Unless Marvel exclusively releases 3D books that cover Wolvy/Cap team-ups from before the Silver Age, then it’s both insane and brilliant.